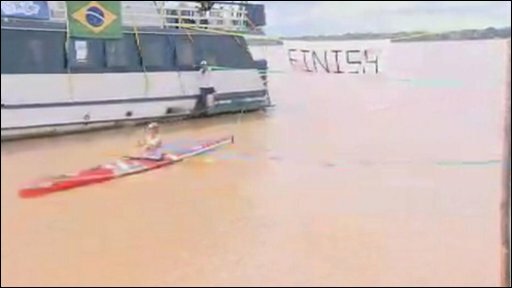 Blue Peter presenter Helen Skelton has completed a 2,000-mile kayak trip along the Amazon for Sport Relief. The records - for the longest solo journey by kayak and the longest distance in a kayak in 24 hours by a woman - are awaiting official verification. Skelton said of her challenge: "It's been tough but I've had enough highs to make it more than worthwhile. "I'm very lucky to have amazing people in my life who've picked me up when things got hard and most importantly inspired me to carry on. "My bottom is bruised, my shoulders are sore and the muscles in my neck are making it hard to differentiate between my head and my shoulders but to be honest I am proud of the war wounds. "I reckon that you shouldn't shy away from things because they're tough or you might fail. Get stuck in and you never know where you might end up." Blue Peter, which is showing Skelton's epic journey in two special episodes on 16 and 17 March, hopes her efforts will inspire families across the UK to rise to their own challenge for Sport Relief. Sport Relief will take place from 19 to 21 March and will raise money for charity schemes in the UK as well as developing countries. It will kick off with a night of entertainment on the BBC, with a sketch from Gavin and Stacey star James Corden and special editions of Masterchef, Top Gear and A Question Of Sport. Other celebrity challenges include rugby ace Lawrence Dallaglio cycling around the Six Nations and BBC One Show presenter Christine Bleakley water skiing across the English Channel.